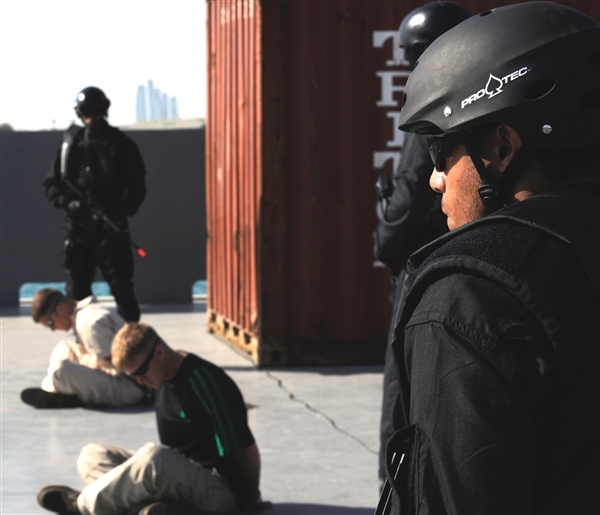 Mem­bers of a board­ing team watch over role play­ers play­ing the part of a hos­tile ship’s crew dur­ing a board­ing and inter­dic­tion demon­stra­tion dur­ing exer­cise Lead­ing Edge 2010 in Abu Dhabi, Unit­ed Arab Emi­rates, Jan. 26, 2010. WASHINGTON, Jan. 29, 2010 — Inter­na­tion­al coop­er­a­tion is key to inter­rupt­ing the traf­fick­ing of mate­ri­als used to make weapons of mass destruc­tion and stop­ping the pro­lif­er­a­tion of nuclear arms, a Depart­ment of Home­land Secu­ri­ty offi­cial said. Mike Per­ron, pro­gram man­ag­er of intel­li­gence and oper­a­tions coor­di­na­tion for the Depart­ment of Home­land Secu­ri­ty, described the aim of a recent multi­na­tion­al exer­cise called Lead­ing Edge 2010 dur­ing a “DoDLive” blog­gers round­table yes­ter­day. Per­ron was one of many U.S. gov­ern­ment inter­a­gency par­tic­i­pants involved in the U.S. Cen­tral Com­mand-host­ed exer­cise, held in Abu Dhabi, Unit­ed Arab Emi­rates. More than 30 nations sent rep­re­sen­ta­tives to share ideas and gain knowl­edge on meth­ods for com­bat­ing weapons of mass destruc­tion. The exer­cise was impor­tant, Per­ron not­ed, because it takes an inter­a­gency approach — includ­ing cus­toms and law enforce­ment — to be suc­cess­ful. The three-day, table-top exer­cise includ­ed three phas­es. The first phase cen­tered on vis­it, board, search and seizure inter­dic­tion mis­sions, in which the U.S. Coast Guard Mid­dle East Train­ing Team pro­vid­ed train­ing to board­ing teams from oth­er par­tic­i­pat­ing coun­tries. An oper­a­tional lev­el phase was based at the port in Mina Zayed, and cov­ered issues of cus­toms, law enforce­ment and oth­er secu­ri­ty issues. This phase includ­ed sta­t­ic dis­plays and live demon­stra­tions. Next, was a strate­gic table top where ques­tions about post inter­dic­tion issues were dis­cussed with sub­ject mat­ter experts. Lead­ing Edge is one of more than 35 exer­cis­es that began with the intro­duc­tion of the Pro­lif­er­a­tion Secu­ri­ty Ini­tia­tive, an inter­na­tion­al agree­ment cre­at­ed in 2003 under for­mer Pres­i­dent George W. Bush’s admin­is­tra­tion. This year’s Lead­ing Edge exer­cise, which con­clud­ed yes­ter­day, elicit­ed pos­i­tive reac­tions from par­tic­i­pants. “I feel like this exer­cise demon­strat­ed a lot of inter­a­gency and inter­na­tion­al coop­er­a­tion,” Navy Cmdr. Tony Crego, of the joint staff strate­gic plans and pol­i­cy direc­torate in the Com­bat­ing WMD Divi­sion, said dur­ing the round­table. “It sends a mes­sage to the pro­lif­er­a­tors that there’s a glob­al net­work of nations, agen­cies and orga­ni­za­tions that are com­mit­ted to stop­ping pro­lif­er­a­tion around the globe,” he added. Although this year’s sce­nario con­cen­trat­ed on a mar­itime exam­ple, future exer­cis­es are slat­ed to focus on aer­i­al and ground trans­port sys­tems.